We also offer special counsel and general counsel (i.e. city attorney) services regarding governing board process and procedure, land use and planning, economic development, policy design and implementation, civil service law and much more. Listed in Martindale-Hubbell’s Bar Register of Preeminent Lawyers, Denton, Navarro, Rocha, Bernal & Zech, P.C., maintains a reputation for integrity and compliance with the highest ethical standards. Our motto is “Rampage Law,” which expresses our commitment to tenaciously and energetically pursing innovative solutions to our clients’ problems. Although skilled litigates, our attorneys promote non-adversarial resolutions to legal disputes whenever possible. In addition, many of our lawyers are former public employees, giving us unique insight into labor relations, employment disputes and other issues affecting our clients. 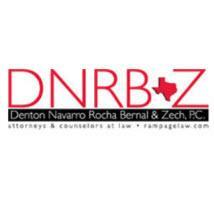 Call the San Antonio office of Denton Navarro Rocha Bernal & Zech, P.C., at 210-227-3243 to arrange an initial consultation about any of our areas of practice.